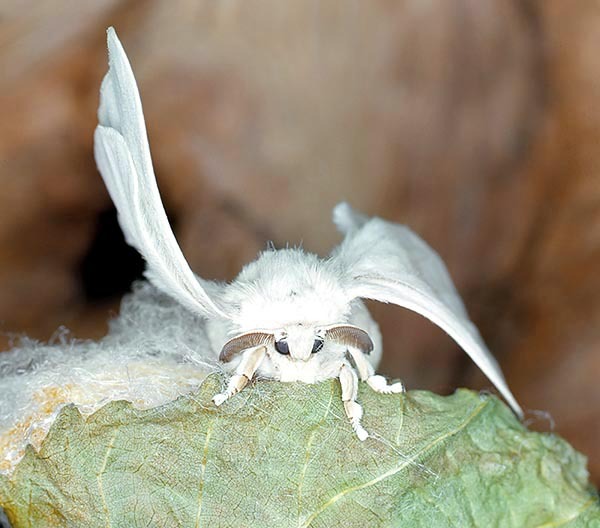 The Silkworm (Bombyx mori Linnaeus, 1758) is a moth afferent to the order of the Lepidopters (Lepidoptera), family of the Bombycids (Bombycidae), family of the Bombycids (Bombyx). This family, although relatively small, includes about 300 species, mostly spread in the eastern region. As a general rule, the members of this family have a hairy and roundish body; in many of them the apices of the fore wings are slightly hooked. The buccal parts are atrophied: these moths, in fact, do not nourish when adult. The caterpillars are usually rather swollen in the fore part, and have an abdomen furnished of one only fleshy caudal small horn. Though looking smooth, they are actually covered by a thick and fine pelosity. They develop mainly on plants of the family of the Urticaceae and pupate in silk cocoons. In the specific case of the silkworm, this moth is bred by the man since thousands of years. Species of the Palearctic area or ecozone, the vastest amongst the biogeographic regions, as it spreads in the northern or boreal hemisphere, from Europe to China and Japan, including also northern Africa up to Sahara. The climate is mainly temperate, with arctic belts and subtropical regions. This species does not exist any more in the wild, but it is the only domestic lepidopteran and bred on an industrial scale. Biologists think that it is native to China and, from archaeological documents they suppose that the silk industry was founded on 2.600 B.C. It may be observed also in farmlands and in agricultural fields. This moth has a 4 to 6 cm wingspan; the alar nervations are well visible. Usually, the wings are white, even if, occasionally, they may be also brown; even if they look as normally developed, the species is unable to fly. The apices of the fore wings are typically hooked; the antennae are typical of the nocturnal species (Heterocera). The caterpillar is usually white with variable brown patterns and pink ocellated spots on the back. 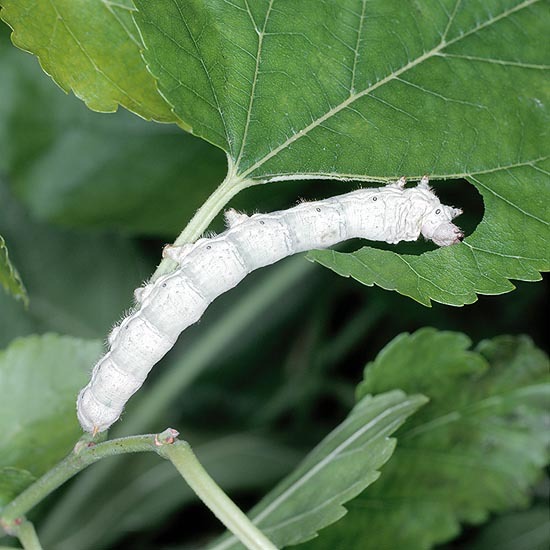 The silkworm is bred on an industrial scale, in sericulture, where it is nourished with leaves of White mulberry (Morus alba). Once pupated, the silk cocoon is harvested and treated for obtaining the precious material (please see the taxonomical text Lepidoptera). Some specimens are allowed to carry out the entire reproductive cycle in order to have an available source of pupae.